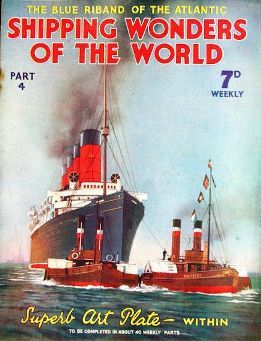 Part 4 of Shipping Wonders of the World was published on Tuesday 3rd March 1936. Tuesdays now became the regular publication day for each part. It included a colour plate illustrating the “distinctions of rank as recommended by the Board of Trade in the Mercantile Marine.” This accompanied an article on the Mercantile Marine. The coloured plate was attached to page 124 of this issue. There was no photogravure supplement. Our cover this week shows the famous Mauretania leaving the Tyne on October 22 1907, to be taken over by the Cunard Line. The Q-ships ceased their activities at the end of the war of 1914-18. But the deeds of the men who manned them have lived on to provide a record of courage and self-sacrifice that cannot be surpassed. The most famous Q-ship officer was Gordon Campbell, whose story is told here. This is the first article in the series Mystery Ship Adventures, and was written by Lieut.-Commander E. Keble Chatterton. The article concludes in part 5. This page illustrates four lightships. They are used to mark sandbanks or other obstructions to navigation where it is impossible to erect a stone or steel lighthouse. The drawings were probably by the “house” artist, K M Sibley. One of the most coveted honours of the sea, the Blue Riband of the Atlantic has a history that is as dramatic and as interesting as any. This is the story of the ships that have won it, after a grim struggle, only to have to yield it up again to some more modern rival. The competition for the Blue Riband has its practical value, too. This chapter includes special pictures of the record-breakers whose name do, indeed, live on in the accounts of their fine achievements. The article is by Frank Bowen. This page illustrates the principal types of buoys and beacons commonly in use in harbours and estuaries. Can, cone and spherical buoys may be lighted or unlighted according to requirements. Steel construction is used throughout. Special buoys are used for a variety of purposes as day signs. Beacons vary in characteristics according to the ground in which they are fixed. Such lights are automatic. Symbol of the changing East, Yokohama has developed in a hundred years, despite obstacles and disasters, from a fishing village to a port that handles more than three million tons of shipping annually. The article is by Sidney Howard. This is the first article in the series Great Ports of the World. Mechanization and steam have not lessened the romance of a career at sea. Courage, endurance and resourcefulness are still called for, and the seas retains its appeal to youth. The old (and not always romantic) days when a boy ran away to sea are long past. But, although there are now a number of special training centres that equip future officers and men for their arduous life, a career in the Mercantile Marine retains its appeal. This chapter is by Frank Bowen and is the first article in the series Going to Sea. The colour plate issued with part 4 illustrates the distinctions of rank as recommended by the Board of Trade. These distinctions are not strictly followed by all the shipping companies. 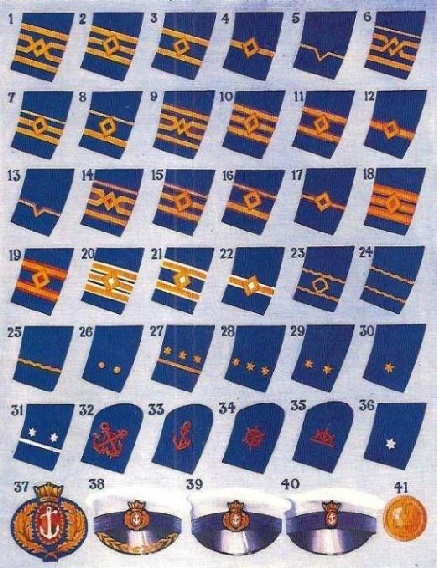 The ranks range from Certified master (1, top left), to Cook (36, lower right). Illustrated on the bottom line are the standard cap badge for officers, Peak of Master’s cap, peak of cap for all other officers, Petty officer’s cap badge, and mercantile Marine coat button. This British Pathe newsreel records the “Queen of Sail” aground near Salcombe (1936).